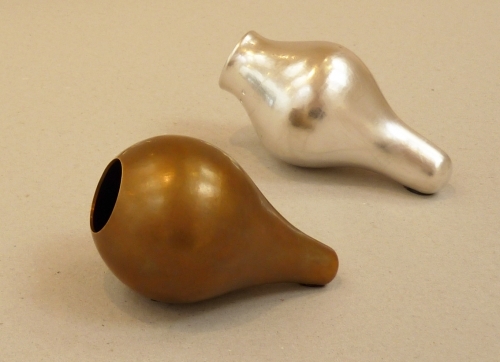 Description : Both vessels were originally made as companion pieces for ‘Gathering Vessel’, where similarly, these smaller offspring pieces inherit tapered ‘ends’ and hollow rounded forms. Most interesting are the visual effects of their different openings upon the whole object. 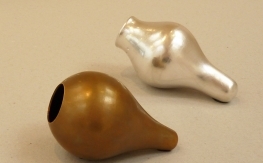 While the silver vessel’s opening reaches further outward, greedily open for more energy, the visual affect is an overly elongated form compared to its sister piece. In contrast the gilding vessel appears satisfied in its growth. Its elegant form has followed its round bulb-like course and concludes contently at its simple ‘thick-cut’ edge. It is a plain form, fulfilled and serene – and a favourite piece. Gilding metal was chosen to further emphasise the opposing characteristics of the two sister pieces, offering greater diversify within a close family of objects.Gilding metal (being a mixture mainly of copper and brass) has the advantage of tarnishing beautifully. Over time the metal has the ability to gradually darken to a chocolate brown colour. Most appropriately this is better encouraged by the handling of the metal, making these objects as desirable to interact with as those of delicate silver.